Plantar Fasciitis is the leading cause of heel pain in adults and can severely affect your mobility if not looked after. The best running shoes for Plantar Fasciitis are ones that support your feet, keep them comfortable, and keep them in a natural position to reduce the load being exerted on them. With so many different shoes on the market, it can be tricky to decide which ones will be best for you in your situation. That’s why we have put this buyer's guide together to help you choose. Plantar Fasciitis can affect everyone in slightly different ways, so when you are looking for the best running shoes for heel pain to help with the condition it is important to keep in mind the particular areas that are most important to you. This could be midsole cushioning, technology that helps with foot positioning, or a better level of bounce to help continue with your stride. Some shoes are designed for mild to moderate overpronators, and some for more severe instances. Of course your doctor will be able to help you determine your precise requirements, but here are some things to think about. Do the shoes provide a good amount of grip? Plantar Fasciitis can be caused and aggravated by uncomfortable shoes, something that Asics have ensured is not the case with these ones by using various comfort technologies in the design. They are made from durable textile and synthetic materials that flex with your feet as you move, and the FluidFit technology adapts around your feet to give a snug fit. The FluidRide midsole will cushion your feet while providing a good bounce back. My favorite feature of these shoes is the GEL cushioning systems, which are built within the fore and rearfoot areas. These have shock-absorbing qualities during impactful motions. There’s also a heel clutching system that improves the fit around your heel, and increases the overall support that is being provided. If you are looking for the best running shoes for heel pain to be comfortable shoes that will provide a good level of support, then these are definitely worth considering. These shoes from New Balance are designed to be comfortable, practical, and focus on providing cushioning. By using a dual density cushioning system, these shoes provide extra comfort and bounce in the k﻿﻿﻿﻿﻿﻿﻿﻿ey areas of your foot that are used when running. The removable insoles feel great on your feet, but the real benefits come from the ability to use your own orthopedic inserts. These can be purchased from New Balance stores, and provide you with a custom fit to the exact contours of your foot to target particularly problematic areas. The blown-rubber forefoot adds extra cushioning on the area that sees the most load while running, and the sole provides a good amount of grip to help you keep stable without aggravating any weak muscles. They are available in a wide range of colors and have reflective detailing, so not matter when and where you go out for a run you will be comfortable and easily noticeable by other road users. With these shoes from Saucony, your foot is centered by the PowerGrid system. This holds the shoe in place and provides you with impact absorption so the pressures through your foot are reduced. The midsole and outsole are made from EVA foam to keep the shoes lightweight and, with a tri-lug design on the outsole, you’ll be confident in the level of grip to avoid slips. The Flexfilm technology uses fewer fabric layers than other shoes, but is tough and flexible so it will move in motion with your foot. The HydroMax collar is effective at keeping you comfortable, and keeping moisture out so your feet will stay feeling fresh and dry. These shoes are available in a range of sharp colors, and have a series of features to ensure your comfort and stability while out on your run. If you want the best running shoe for Plantar Fasciitis to stand out, while giving a good level of support and comfort, then this is well worth a look. This shoe has been specifically designed to help moderate pronators who suffer from foot problems as a result. To do this it features a combination of elements that reinforce your stability and provide a good amount of cushioning. The upper part of the shoe is made from a breathable mesh and lightweight materials that form a perfect fit around the foot. They also have moisture-managing properties to help your feet remain cool and dry. The midfoot saddle is adjustable so you get a more secure fit, and the BioMoGo DNA system provides a high level of cushioning throughout the whole shoe. A full length, segmented crash pad helps with smooth transitions. The best part of this shoe is the tri-density midsole. This has been designed to promote progressive pronation control and will help with your foot position throughout the entire gait cycle. With this shoe, Asics have created something that will help with your foot position as you run. They provide a great level of cushioning to ensure the loads that go through your sole are reduced, so you can continue to run for longer in greater comfort. If you are looking for the best running shoes for Plantar Fasciitis to help with your running position, this would be a great choice to consider. The GEL cushioning system in the fore and rearfoot areas provide shock absorption, and works in conjunction with the Impact guidance system that enhances your natural gait and will help reduce aggravating Plantar Fasciitis. The FluidRide system is also a great addition. It provides further cushioning, but it also gives a firm bounce back effect to assist with your movement into the next stride. This, along with the soft, flexible materials that the shoe is made from, ensures you will get a great fit and significantly reduce the pressures that your foot experiences. These shoes from Asics come in bold colors, and are full of cushioning to ensure your feet are kept comfortable and sturdy while running. If you are looking to stand out with your best running shoes for sore heels, have a great level of cushioning, and reduce the pressures that are being put on your feet, then this could be a great option for you. The GEL cushioning midsole provides cushioning and shock absorbing qualities, as well as helping to keep your foot in a natural position and support the vulnerable parts. The ComforDry sockliner is effective at keeping moisture out, so your feet are left feeling fresh and dry. It’s worth noting that you may need to order a size larger than usual with this product. This is important because the shoes are designed to give you a tight snug fit, and you must get the right size to fully take advantage of this. These shoes have been designed for comfort, and can be a great help with Plantar Fasciitis because of the heel and arch support they give. If you are experiencing pain in your feet, then these are a worthy option to consider to provide you with relief. They are the most expensive in this guide, but with that comes a superior level of protection. The dual density collar performs two functions. It has a soft density foam against the foot that adds extra cushioning, and a firm density foam to increase overall support in the arch. They are made from lightweight materials to reduce the load on your feet and ankles, and the blown rubber forefoot gives further cushioning. They are also available in a decent range of colors to suit your tastes, and can be used with orthopedic inserts to give you a further customized level of comfort and support. These shoes are available in a range of vibrant colors, and have a series of features to ensure your comfort and stability with your best athletic shoes for Plantar Fasciitis while out on your run. Your foot is kept central by the PowerGrid system. This holds the shoe in place and provides you with impact absorption so the pressures through your foot are kept to a minimum. The midsole and outsole are made from EVA foam to keep the shoes lightweight and, with a tri-lug design on the outsole, you’ll be confident in the level of grip you get that will help you avoid slips. If you want a shoe that will stand out, while giving a good level of support and comfort, then this is definitely worth looking at. The upper part of the shoe is made from a breathable mesh and lightweight materials that form a perfect fit around the foot and also have moisture-managing properties to help your feet remain cool and dry. The plush tongue and collar keep your feet comfortable and will reduce any rubbing. The best part of this shoe is the tri-density midsole. This has been designed to promote progressive pronation control and will help with your foot position throughout the entire gait cycle- making them a good choice as your best running shoes for Plantar Fasciitis. These shoes from Asics have been designed to keep you running longer by providing a great deal of comfort and energy efficiency. GEL cushioning within the fore and rearfoot areas provide a high level of shock absorption, so your feet are not subjected to such high pressures; and the FluidRide system provides extra cushioning and an increased amount of bounce back as you run. The clever impact guidance system links the guidance line and trustic system, which has the effect of keeping your foot in a more natural position, and encourages a better movement overall. Further padding in the tongue and soles will provide your feet with even more comfort, while firmly holding them in a good position. If you are a mild or moderate overpronator, then these shoes are well worth thinking about. They provide a great level of stability and support, and will make your runs a far more comfortable experience. 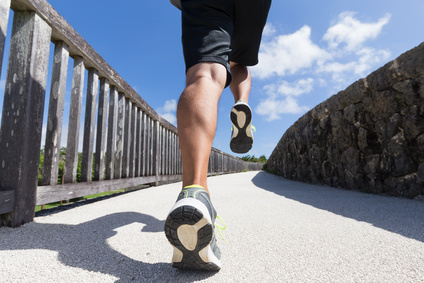 Plantar Fasciitis can make any activity on your feet a painful experience, especially if you want to go running. Shoes won’t completely solve the problem, but they will go a long way to help by providing support, cushioning, and overall comfort. Our choice for the best running shoes for Plantar Fasciitis is the Asics Kayano’s for both men and women. They are well cushioned for comfort, and rigidly designed to supply you with a good level of support.